The Breville BES870XL Barista Express grinds and brews in one machine. The built-in water spout and steam wand make it even more convenient to create a wide variety of espresso-based drinks. It can be used as a super automatic or semi-automatic espresso maker. Easy to use, but also highly "tweakable"
A top-shelf machine at a good price. The Breville BES870XL Barista Express includes a built-in conical burr grinder, integrated steam wand and dedicated water spout. It's one of two top picks at one professional test kitchen where gets top grades in espresso quality and milk frothing. 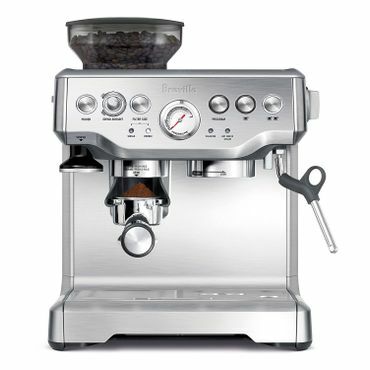 Reviews.com, where the BES870XL is also the top pick, concurs, saying, "The Breville was one of the few that gave us truly gorgeous colors as the espresso flowed out of the portafilter." Reviewing the Barista Express for CNET, Brian Bennett says the BES870XL makes espresso that's better than even much pricier machines. Owners agree, saying this machine gives you all the tools you need to make a great cup of espresso, or any espresso-based drink, such as cappuccino or latte. The removable water tank holds a generous 64 ounces. The hopper on the grinder is also removable for storage to keep the beans at their freshest and the included tamper stores right in the machine. Be as hands on -- or off -- as you like. Whether you like to fiddle with every cup or just pull a quick shot, the Breville BES870XL Barista Express is sure to please -- although both Reviews.com and CNET note that it's not as hands off as fully automatic machines (which tend to also be much pricier). With grind-size adjustments, up to 15 bars of pressure, water-temperature controls, and the ability to choose the extraction volume, you can endlessly tweak your brew. Many aspiring baristas love that ability, while others appreciate the intuitive controls and easy-to-eyeball pressure gauge that enables them to just turn out consistent shots without too much fiddling. 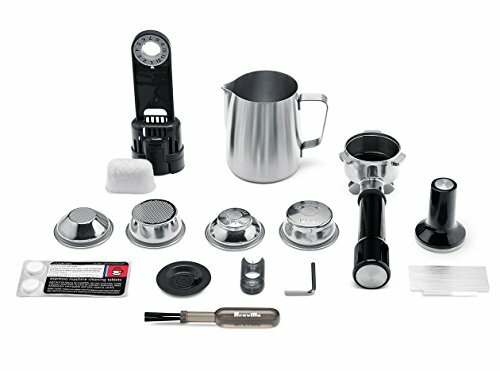 However, all of that customization leaves some owners confused, because it can make the Breville BES870XL Barista Express seem more difficult to use than it really is. We saw a number of soothing comments directed at overwhelmed users assuring them that if they just follow the basic instructions, using the Breville BES870XL Barista Express couldn't be simpler. A positive addition to your kitchen. Described by reviewers as "solid and attractive," and by one professional test kitchen as "a handsome machine," the stainless steel version of the Breville Barista has a look that's more like a commercial espresso machine, rather than a coffee maker, reviewers say. But plenty of others love the other two colors it comes in -- Cranberry Red and Black Sesame. This machine seems very sturdy and users like the rubberized feet that keep it firmly in place. Although, at 13.2 by 12.5 by 15.8 inches, it's not small, since it has the integrated grinder it also takes up much less space than two kitchen gadgets would. Owners say the BES870XL is very easy to clean and they like the removable drip tray and hidden compartment for storing the cleaning tools. It comes with a relatively short, one-year warranty, but Breville has an excellent reputation for customer service.